1. Before installation, make sure you have every part of the pneumatic butterfly valve with the exact model number, no impurities in the valve body, no clogging in the solenoid valve and in the valve silencer. 2. Shut down the valve and air cylinder. 4. After installation, test the pneumatic butterfly valve under 0.4-0.6 MPa (normal circumstances), manually open and close the unenergized solenoid valve, observe the valve's opening and closing status. If there is certain difficulty in the initial phase of process and later get back to normal, turn down the cylinder stroke until it can be open and closed smoothly and without any leakage. (Move the switch of the valve to the "on" position and turn off the air cylinder. Then slightly adjust the positions of the screws at each side of the air cylinder inward.) Another thing to note is that sound moderator can regulate the speed of valve, but the valve may not be able to move when the sound is regulated too low. 5. Keep it dry, do not put it in the open. 6. Before installation, ensure that there is no impurities, like welding slag, in the pipeline. 7. Manually open and close the butterfly valve, choose a moderate resistance, match the torque of valve and that of picked actuator. 8. 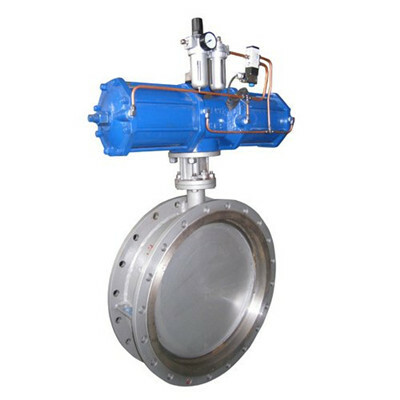 The specification of the flange used for connecting the butterfly valve, the standard of pipe need to be correct, and correspond to that of flange clamp and that of butterfly valve flange, respectively. Use specific butterfly valve flanges, rather than slip on flanges. 9. Do not weld the flange again after valve installation, so as to prevent melting rubber. 10. The installed pipe flange has to be aligned with the butterfly valve. 11. Install and fasten all the flange bolts, discreetly turn on and off the butterfly valve, make sure it works smoothly. 12. Fully open the valve, fasten the screws (Do not fasten them too tight, which will deform the valve ring and enlarge the torque.) in pair according to diagonal lines, no need of gasket.